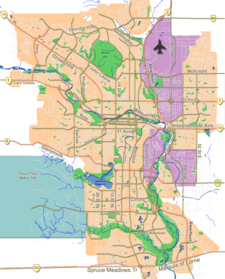 Saddle Ridge is a residential neighbourhood in the north-east quadrant of Calgary, Alberta. It is located at the north-eastern edge of the city, and it is bounded to the north by 96 Avenue NE, to the east by 68 Street NE, to the south by McKnight Boulevard and to the west by Métis Trail. The Saddle Ridge Industrial Area and Calgary International Airport are located west of the neighbourhood. The community initially consisted of acreages, with an active community association since the 1970s; in the late 1990s, urbanization of the region began and, today, Saddle Ridge primarily refers to the urban community that has developed around the commercial hub formed by Saddletowne Circle, although a number of acreages remain. The western portion of the area is called Saddle Ridge Industrial and is earmarked for future light industrial and commercial development. It is represented in the Calgary City Council by the Ward 3 councillor. In the City of Calgary's 2012 municipal census, Saddle Ridge had a population of 14,372 living in 3,668 dwellings, a 7.3% increase from its 2011 population of 13,388. With a land area of 5.5 km2 (2.1 sq mi), it had a population density of 2,613.092,613/km2 (6,767.96,770/sq mi) in 2012. Residents in this community had a median household income of $71,101 in 2005, and there were 12.9% low income residents living in the neighbourhood. As of 2006, 47.0% of the residents were immigrants. A proportion of 1.3% of the buildings were apartments and 3.5% of the housing was used for renting. Saddle Ridge Elementary School serves students, the school accommodates Kindergarten to Grade 4 students residing in Saddle Ridge. Alongside Saddle Ridge Elementary school, recently opened Hugh A Bennett School providing Kindergarten to Grade 4 students. Peter Lougheed Junior High School also recently opened in Saddle Ridge. Students who’ve competed Kindergarten - Grade 4 are later welcomed to Peter Lougheed. Welcoming students from Grade 5 - Grade 9, Nelson Mandela the high school of students who live in the community of Saddle Ridge. ^ a b City of Calgary (April 2012). "Community Social Statistics: Saddle Ridge" (PDF). Retrieved May 30, 2012. This page was last edited on 25 April 2018, at 13:04 (UTC).